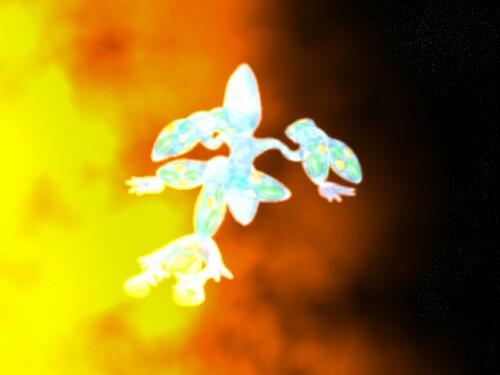 After completing all the new 3D models for a race of aliens known as the tylmai I created a feature scene positioning the energy based creatures near to a glowing sun. The above image shows a closeup of this a battle station docking with a few escorts and a battleship, while below the full scene shows several battlestations in orbit with a fleet passing near by. All the models and the scene were renders using 3DStudio Max. There was very little post-processing done to the image. 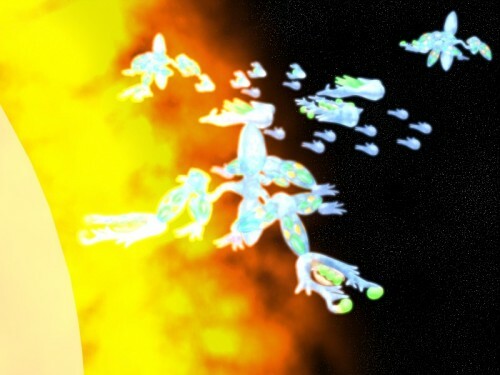 3DSMax's own video-post feature provided the glow overlay for the spaceships, and lighting flare effects were used to create the surface of the sun. Setting the colours and brightness for this image were difficult. It is assumed the scene is being view through some filter, as being in such close proximity to the sun would surely blind the scene. It is also indicated that the energy ships would glow so brightly as any details could not be seen by human eyes.